The writing is on the wall: Coal generation in the U.S. has reached a “coal cost crossover” point, meaning the all-in costs of new local renewables is becoming less than the mere operating costs of old coal. Utilities and their regulators must adapt to changing energy economics before they’re stuck with stranded assets. New wind costs as low as $15 per megawatt-hour (MWh), and solar costs as low as $28/MWh. Those prices are lower than the combined operational, maintenance, and fuel costs of generating electricity from most existing coal-fired power plants. Because of this clean, low-cost competition, 74% of existing U.S. coal capacity was “at risk” in 2018, meaning the plants could be replaced with new local wind or solar projects built within 35 miles of each existing plant. 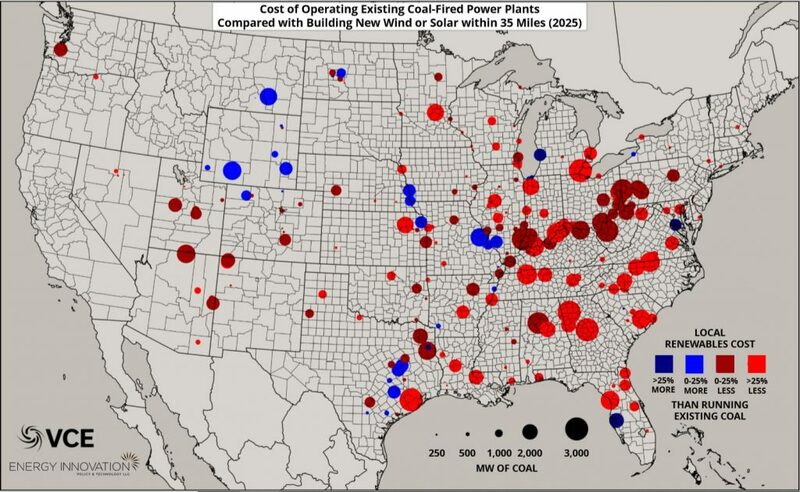 By 2025, at-risk coal increases to 86% of the U.S. coal fleet, even as federal renewable energy tax credits phase out. Note that this analysis is based on renewable energy available within 35 miles of each existing coal plant. Building renewables in the immediate vicinity of coal plants implies wind and solar could replace lost jobs, expand the tax base, and reuse transmission—all within the same utility territory. That is a remarkable finding, and it is a wake-up call for utilities and their regulators. Any coal plant failing the cost crossover test is a candidate for a clean replacement—and doing this cleverly means consumers save money while jobs are preserved. Some forward-looking utilities are getting ahead of this trend: Xcel Energy is targeting 100% renewables by 2050, PacifiCorp revealed 60% of its coal fleet is uneconomic and is reviewing its options, and Indiana’s NIPSCO want to replace all of its coal with clean energy in ten years. The coal crossover test is just the first step in thinking about closing existing coal. 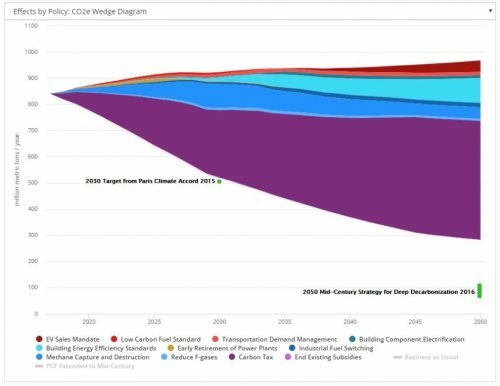 Replacing coal output with new wind and solar energy is complex in practice; policymakers must find ways to enable utilities to profitably retire uneconomic coal generation. Coal securitization legislation introduced in Colorado’s state legislature and passed in New Mexico’s state legislature, endorsed by Governors Polis and Lujan-Grisham, is one example of smart policy to speed the transition and reduce customer costs, all while keeping utilities whole. Regulators, utilities, and investors must get ahead of the coal crossover while helping customers and affected communities. Using the right financial tools can speed the transition and help make workers, companies, and the public whole. Hal Harvey’s Insights and Updates offers monthly thoughts and analysis on current energy and climate topics. These newsletters are written by Energy Innovation’s CEO Hal Harvey. Sign up here to receive Insights and Updates straight to your inbox. Subscribe to our e-mail newsletter to have the latest Insights and Updates from Hal Harvey delivered to your inbox.